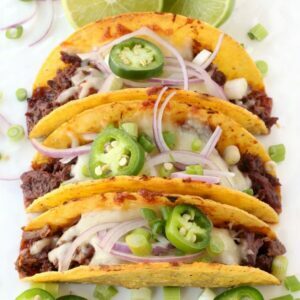 These Pan Fried Beef Tacos are so crispy on the outside, they’re totally addicting! 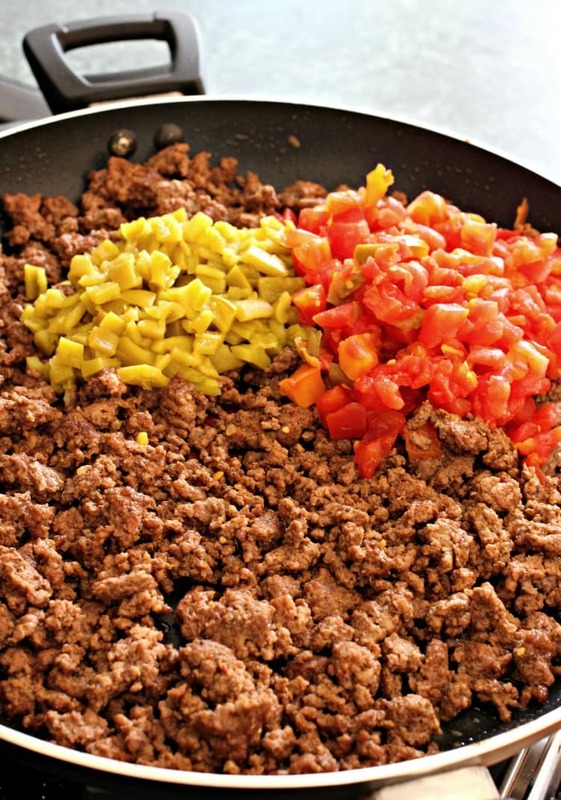 This taco recipe is going to add a whole lot of fun to taco night! 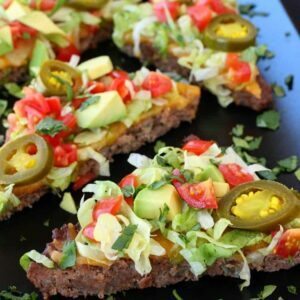 If you love tacos as much as we do, try our Homemade Beef Taco Recipe with a “crunchy” shell…as our son calls them…or for a low carb taco recipe you can make our famous Naked Sheet Pan Tacos! Yep, we’re going to make fried tacos. Trying something fun and different on taco night is always a good thing. Id a fried taco just a quesadilla? It did seem like a quesadilla cut in half, but the most delicious taco quesadilla ever. 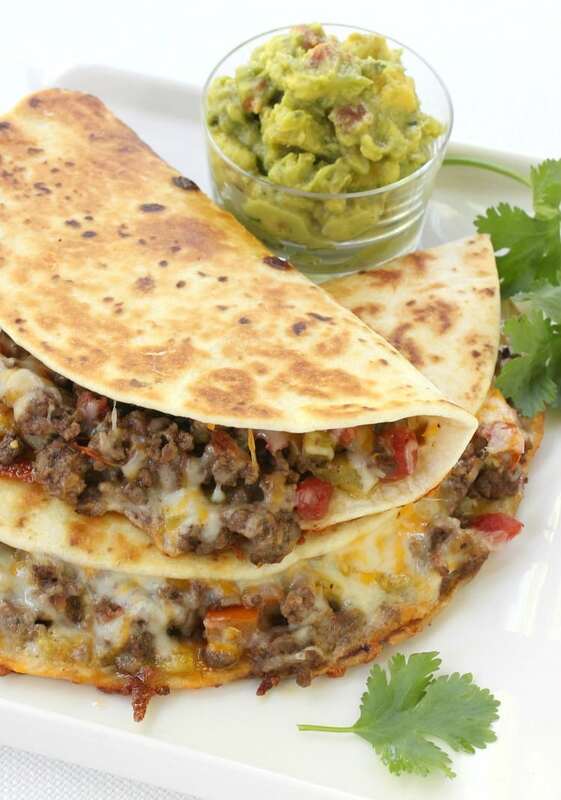 We actually make quesadillas a lot at home, it’s one of the boys favorite dinners. 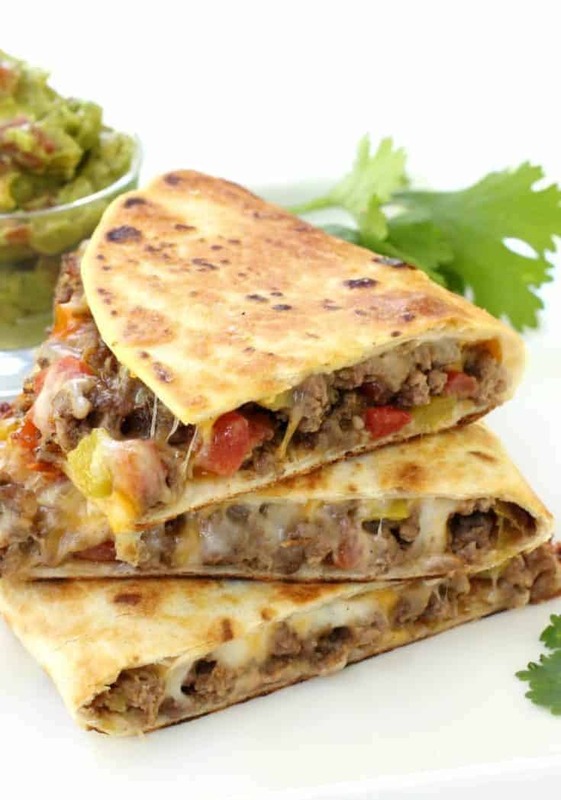 These Chicken Enchilada Quesadillas or Sausage and Peppers Quesadillas, or these Meatball Pizza Quesadillas…we love them all. So these pan fried tacos are basically a tasty beef taco with a super crispy shell. I guess sort of like a chalupa? But the best part about these fried tacos, besides the way they taste is that they don’t fall apart when you eat them! That is a taco recipe WIN if you ask me. How Do You Make Fried Tacos? These tacos are so easy to make, I promise you’re going to be making them all the time. Just start out by making the beef filling, which has beef, of course, but also diced tomatoes and green chiles. Get the filling into a bowl and carefully wipe out the skillet with a few paper towels – this is the same pan you’ll be using to make your tacos. Flip the empty side of the tortilla over to cover the filling half and press down with a plate or a spatula. Cook for a few minutes until the bottom is crispy then flip the fried taco over to get the other side nice and crispy too. 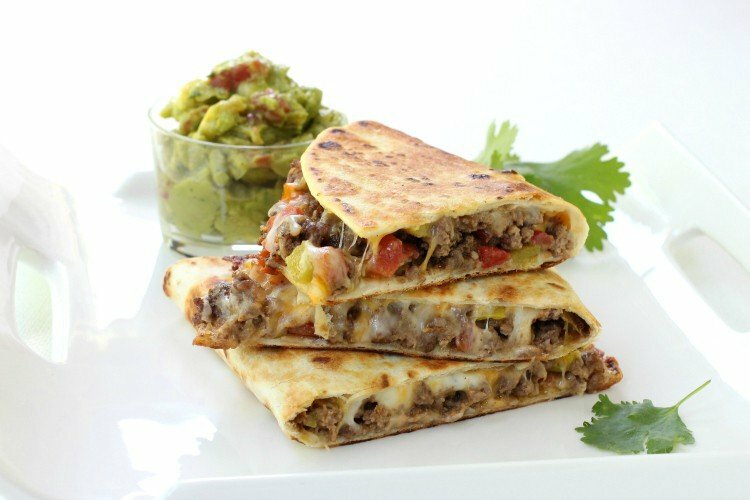 Can I Use Different Meat For The Taco Meat? Definitely! Ground turkey or pork will work, even shredded chicken! Leftover chicken or a rotisserie chicken cut up would be awesome in this taco filling. So although making tacos is super easy, it’s not the hard part. Am I Right? The hard part about tacos is getting ALL the toppings in little bowls or plates on the table. Because if you’re eating tacos at my house, there’s going to be a lot of topping options. Which is what makes these pan fried tacos even better – there’s no toppings to set out because all the flavor is on the inside! We also love serving this taco recipe with guacamole, salsa and sour cream on the side for dipping. Serve these fried tacos to your friends and family on taco night and see how much they love them! 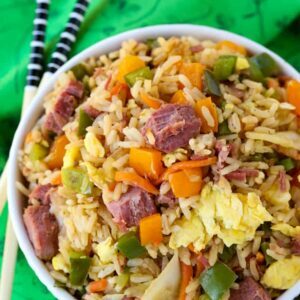 Head over to Food Fanatic where you can get this recipe and tons of mouth-watering meals! Looking For More Fun Taco Recipes? This fun taco recipe makes taco night a breeze! No bowls of toppings to set out, all the flavor is right inside! Add the beef, breaking up with a spoon into crumbles until completely cooked through. Drain the grease and return to the skillet. Next add the diced tomatoes, green chiles, salt, cumin and garlic powder. Stir and cook for 2-3 minutes to warm the filling through, then transfer to a bowl. Carefully wipe out the skillet with paper towels and spray with cooking spray. Place a tortilla in the skillet and top one half of the tortilla with about 3/4 cup of the filling and 1/2 cup of cheese. Fold the tortilla over to cover the meat half (like an omelette), press down with a spatula or a plate and cook for 2 minutes until the bottom is crispy. Flip the taco over to crisp up the other side, another 2 minutes, then remove from the skillet and repeat with the remaining tortillas. *You can heat your oven to 250-300 degrees to keep the tacos warm while you cook the rest. This nutritional information is for informational purposes only. As I am not a nutritionist, this information is provided only as a courtesy. We have been frying flour torts since I was a kid…57, and sprinkling with shredded cheese. Then proceed with making tacos. This filling is an awesome change to reg. tacos!! Thanks am going to make this tonight!!! Sheri, thank you for commenting! I love to hear those stories, let me know when you do try them! Would i need to spray the pan or add a little oil when i place the tortilla in the pan with the filling? I worry about the tortilla sticking placing it straight on the pan after wiping it down. Also i use tortillas that need to be heated on the pan to form would those be okay to use? I’m not sure what kind of tortillas you’re using, but I’m sure they will be fine. You can spray the pan or add a little oil first, but the tortilla shouldn’t stick to a dry pan. I haven’t tried before but if you do I would suggest heating in the oven and then crisping back up in a skillet at the end. The homemade sourdough tortillas sound amazing! I’m confused about all the grease!! First the oil before you put the meat in, and then you don’t even drain the meat? you can drain the meat if you like! I enjoy reading your posts and recipes! Boyfriend sent me this recipe, so I will be making these tonight. Sounds and looks delicious, and I can’t wait to try them!!!! Awesome! Let me know how you like them!